Last major update issued on January 12, 2005 at 03:40 UTC. The geomagnetic field was quiet to active on January 11. Solar wind speed ranged between 388 and 464 km/sec. A moderately high speed stream from coronal hole CH138 ended at about 14h UTC. At about 20h UTC a strong high speed stream from coronal hole CH139 arrived at ACE. Solar flux measured at 20h UTC on 2.8 GHz was 94.2. The planetary A index was 14 (STAR Ap - based on the mean of three hour interval ap indices: 14.0). Three hour interval K indices: 14422323 (planetary), 14422323 (Boulder). Region 10718 developed slowly. The region became more complex as positive polarity flux emerged just ahead of the leading negative polarity spots. C flares are likely. Further development will increase the likelihood of M class flares with associated Earth directed CMEs. 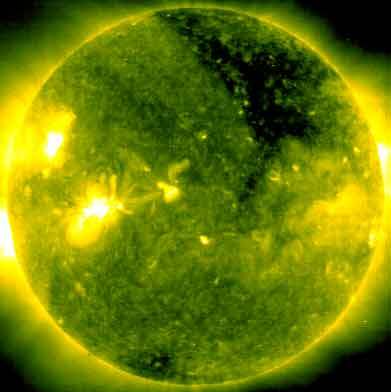 Flares: C1.4 at 16:16 and C1.1 at 23:29 UTC. Region 10720 developed extremely quickly and already has the potential to produce M class flares. This is a compact region with little separation between the opposite polarity areas. A magnetic delta structure could easily form in the northern central part of the region if the current rate of development is sustained. January 9: A large partial halo CME was observed in LASCO images after the M2 event in region 10718 at 08:51 UTC. 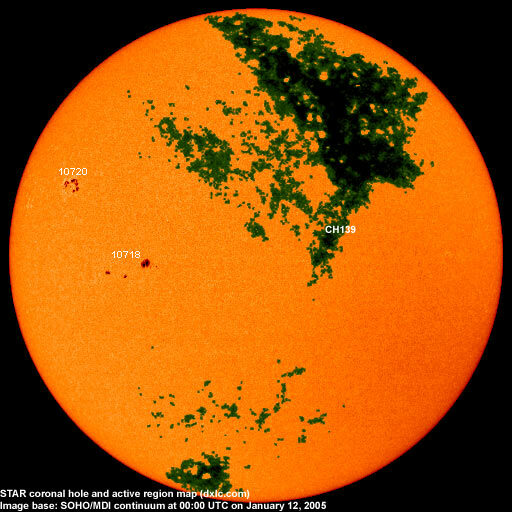 January 10-11: No obvious fully or partly Earth directed CMEs were observed. An extension (CH139) of a large coronal hole in the northern hemisphere was likely in a geoeffective position on January 9-11. 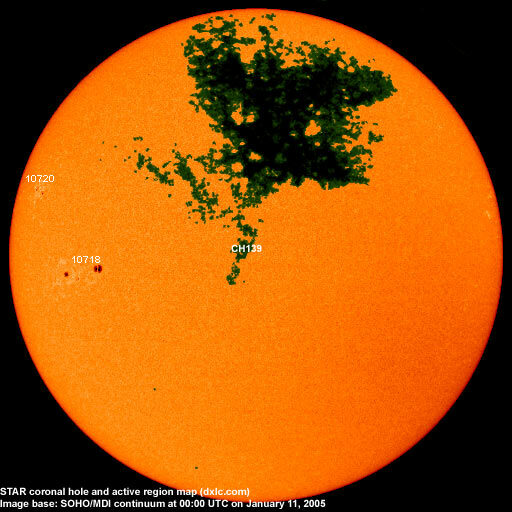 The geomagnetic field is expected to be unsettled to major storm on January 12 and quiet to minor storm on January 13-14 due to a high speed stream from coronal hole CH139. A flanking impact from the CME observed on January 9 is possible on January 12. Long distance low and medium frequency (below 2 MHz) propagation along east-west paths over high and upper middle latitudes is very poor. Propagation along long distance north-south paths is fair. Trans Atlantic propagation conditions are normally monitored every night on 1470 kHz. Dominant stations tonight: Radio Cristal del Uruguay and an unidentified station from Brazil. On other frequencies propagation was best towards Brazil. CBN Aracajú on 930 kHz had an unusually good signal.